SmartSenseCom (SSC) high performance microphones and accelerometers enjoy a deep heritage in generations of acoustic sensing research and development at the Naval Research Labs. The Navy needs highly sensitive instruments that detect and characterize wave forms in a wide range of environments. The Naval Research Labs invested several decades in the evolution of the technology that SSC uses. The result: SSC produces microphones, acoustic sensors and accelerometers of unparalleled performance for field and harsh environments. SSC’s high performance optical microphones achieve breakthrough performance compared to the best instrument microphones on the market today. Their passive optical design and simple mechanical structure eliminate electronic and thermal noise and is inherently more robust in the field. They provide exceptional uncorrected accuracy across a wider frequency range, with the capability to measure from fractional Hertz to 200 kHz. 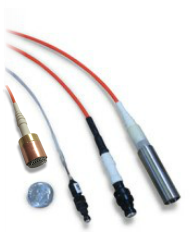 SSC acoustic sensor systems have a low power budget (a little more than 2 W per channel), provide size and weight savings compared to condenser microphone based systems, do not require recalibration, and their performance is not impacted by environmental factors, delivering nearly identical performance in the lab or in the field. SSC intensity modulated optical vibration sensing provides exceptional sensitivity and low frequency measurement compared to alternative products. As with all SSC sensors, their passive optical design delivers nearly identical performance in indoor, outdoor, or harsh environments, can be placed up to a kilometer or more away from the electronics where remote sensing is required, and reduce the size, weight and power of the measurement system. SSC’s optical accelerometers are ideally suited for tunneling detection, perimeter security, structural dynamics, equipment monitoring, product test and evaluation, and more. Compatible – Digital output is compatible with existing analysis platforms (e.g., LabView).